For many years Claire worked within the Financial Services industry as a qualified Financial Adviser, until she joined a local firm of Solicitors in September 2007, where she worked as a Paralegal within their Private Client Department gaining experience and knowledge within their Wills, Probate and Court of Protection Teams. Whilst working full time, Claire also studied during the evenings at Manchester Metropolitan University where she obtained a 2.1 LLB hons degree. Claire continued with her studies and ultimately qualified as a Solicitor on 15th May 2014. Claire is a Full Accredited member of Solicitors for the Elderly. 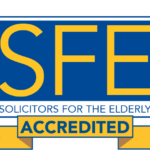 In order to be a fully accredited SFE member, lawyers must have a minimum of three years’ experience advising in areas of older client law and have completed the Older Client Care in Practice Award – a qualification which demonstrates the specialist client care skills that enable lawyers to advise and support older and vulnerable clients. Members are also required to continuously update their knowledge with training and produce an annual statement of competence, which ensures they maintain their expertise.